Up until any data or grades have been entered by teachers, most setup components of the report card are able to be easily changed and will not harm, tamper, or delete critical data. The moment users being to enter report card data and/or grades, variou setup components can no longer be changed without changing the data. This lesson focuses on what can and what cannot be edited, changed, or deleted within an Elementary Report Card once data has been entered. Note: The ability to edit and change report card setup components is a permissable feature, typically only for System Admin or those with assigned with permission(s). Have you tried to change or edit a piece of your report card and have received one of the messages above? That's because, you've got data in there! Let's say the title of a Field needs to be changed a day or two after teachers have begun entering grades. It's quite possible a message like the above may appear on your screen, depending on what you are trying to change. We do this on purpose, because once there is data, changing critical components such as value scale, value set, fields and how fields pull data, you could be altering and changing data teachers have already entered, or worse, changing settings to report cards from the previous grading period. NOTE: Keep in mind, any fields removed or deleted and have been placed on the Report Card layout, will need to be remapped. In addition if data has been previously entered and the field has been removed or deleted, data entered will be erased and removed from the report card. After a field has been created, there are various components that can be changed or edited. 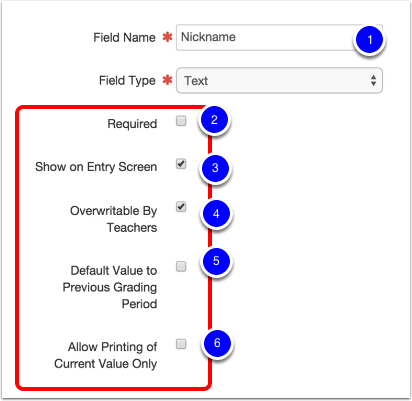 Field Options such as Default to Previous Grading Period (5) and Allow Printing of Current Value Only (6) will respect values already selected and entered by users but update (when applicable) any blank fields with appropriate values. To learn or revisit about Fields, visit Create Report Card Fields. 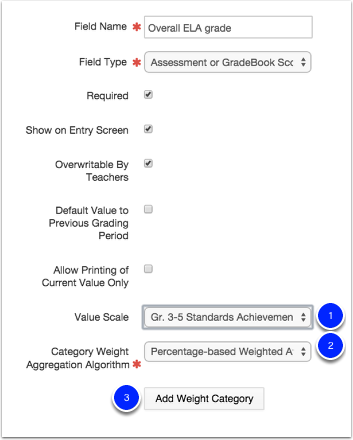 When the field type Assessment or Gradebook Score is selected, the setup requires to select a Value Scale and Category Weight Aggregation Algorithm. Once the algorithm is selected, the setup process prompts the admin to create a Category, or how to further aggregate the data pulling from Gradebooks, Assessments, Standards, and/or Question Groups. Based on the calculation selected (in support of Gradebook Practices), Category Types may vary. In support of a Percentage Based Gradebooks, the algorithm selected should be Percentage-based Weighted Average. In support of a Standards-Based Gradebooks, the algorithm selected should be Rubric (Beta). Category Name (1) - The name can be changed at any time and does not effect previously entered data. Allow Teachers to Link Gradebooks (2) and Allow Teachers to Link Assessments (3) - At any point these checkboxes can be selected. Previously entered data will not changed, until Teachers reconfigure their Data Links. Assessments (4), Standards, or Question Groups (not shown above) - At any point selected assessments, standards, or question groups can be removed or added to complete the category expectations. However, be advised, once data links have been configured, data may change and reset to the defaulted value. For more information, visit Category Types and Calculations. Add Value (1) - An additional value can be added to a value set, becoming added to the drop-down or menu of options a user can choose from. Any previous data will remain untouched since the previous abbreviations, descriptions and entered values have not changed. It would be best to communicate to users of any new values added, in case it applies to their students. Description (2) - You can change the text in the Description without losing data. To learn or revisit about Predefined Value Sets, visit Create Report Card Predefined Value Sets. Add Band (1) - An additional value can be added to the Value Scale. Most of the time, an additional value of <blank> and n/a is needed for when students do not have a grade coming from gradebook, assessment, or standard onto the report card. Sort Bands (2) - The sort order fo the bands can be rearranged if necessary. IMPORANT TO KNOW: Predefined Value Scales are created yearly and used for Report Cards throughout (most of the time) all grading periods within the year. Any changes made to a value scale, will effect all previously entered data from previous grading periods and fields it is applied to. Sometimes it might be best to create a new Predefined Value Scale and apply it to the field instead, due to previous data being tied. Users will still have to reselect values from the new set, but past data won't be harmed. To learn or revisit about Predefined Value Sets, visit Create Report Card Predefined Value Scales. After a field has been created, there are various components that cannot be changed or edited. Field Type (1) In order to change the field type, it must be deleted and recreated. 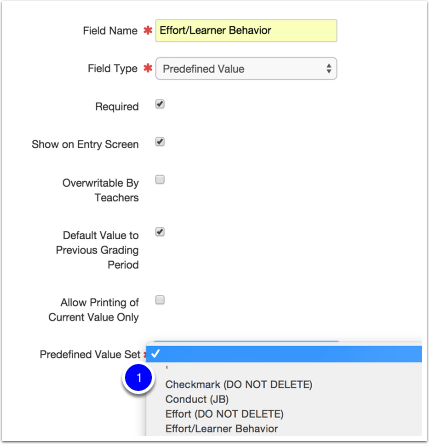 Field Options like Default Value to Previous Grading Period (2) and Allow Printing of Current Value Only (3) - If data is previously entered and this option is selected, any pre-entered or manually entered data will be overwritten with the previous Grading Period's data. Predefined Value Set (1) - If a new or different Predefined Value Set was selected after data has been entered, all previously entered data will be removed. 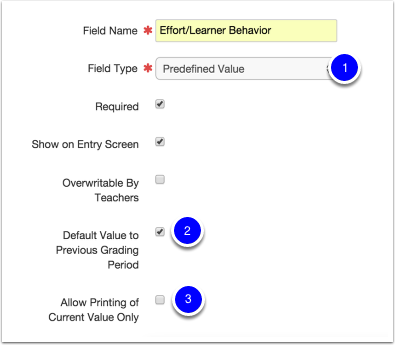 Users will have to reselect values from the new value set in the entry screen for their students. Value Scale (1) - If a new or different Predefined Value Scale was selected after data has been entered, all previously entered data will be removed. 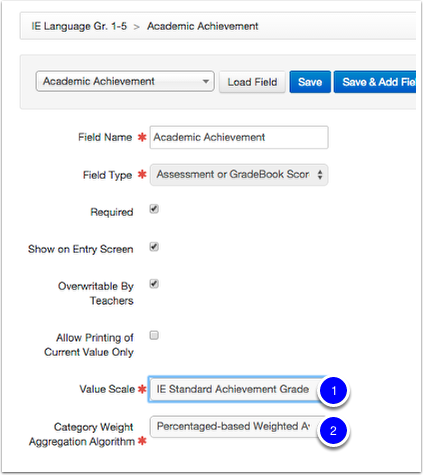 Users will be shown the new default values from Gradebook and/or Assessments, and when applicable will have to reselect values from the new value scale in the entry screen for their students. Category Weight Aggregation Algorithm (2) - Once selected the algorithm determines how Gradebook and/or Assessment data needs to aggregate properly, most commonly focused on supporting Performance Based Gradebooks and Standards Based Gradebooks (for example). Once an algorithm has been selected, it prompts the admin on how to continue building the field. If this is changed after data has been entered, the field category and information will be removed. To learn or revisit about Predefined Value Scale, visit Create Report Card Predefined Value Scales. Category Type (1) - The type cannot be changed was selected. If a new category type is needed, the entire category must be deleted and created again. Aggregate Calculation (2) and Weight (3)- Although this can be changed, it shouldn't be. If it were changed after data has been entered, any and all fields will recalculate the Gradebook/Assessment data, showing a new default value and remove all previously entered data. Assessments (4), Standards, or Question Groups (not shown above) - Once data links have been configured, data will change and reset to the defaulted value. Previously entered data will be removed. If a Field Type of Text or Free Entry Comment is selected, an option to display the Maximum Character Count is available. When entered, it will show users upon the entry screen a ticker of how many word they are counting and how many words they have left, based on the number placed here. 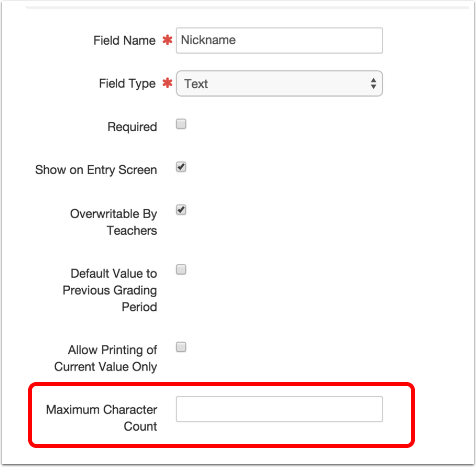 If a value is later added after data has been entered, it will cut off and not print characters passed the maximum amount, regardless of the layout space designated (if larger than the character count suggested). To learn or revisit about this field type, visit Report Card Field Type Guide. Depending on the need, sometimes it is better to remove or delete the field and start again, especially during the setup/pre-entry window time. Once data has been entered, deleting the field will completely remove all previously entered data as well. Keep in mind, if any fields removed or deleted and have been placed on the Report Card layout, you will be prompted that there have been changes made to the layout and to remove the fields that no longer exist. For more information, visit Editing or Changing Fields. Abbreviation (1) - Changing the abbreviations will remove previously entered data, having users go back and select a new value in the entry screen. Remove (3) - Removing a value can remove previously entered data of that value, having users to go back and select a new value in the entry screen. It's almost treating it like a NEW value set, while also effecting previous grading periods and other fields it is applied to. IMPORANT TO KNOW: Predefined Value Sets are created yearly and used for Report Cards throughout (most of the time) all grading periods within the year. Any changes made to a value set, will effect all previously entered data from previous grading periods and fields it is applied to. Sometimes it might be best to create a new Predefined Value Set and apply it to the field instead, due to previous data being tied. Users will still have to reselect values from the new set, but past data won't be harmed. When a value set is deleted, you are risking data to be removed from all previously entered grades for all report cards within the year. Please contact Illuminate Support Team for assistance. Lower Bound (1) and Display Value (2) - The lower bound number is how the system understands how to calculate the gradebook or assessment score properly. 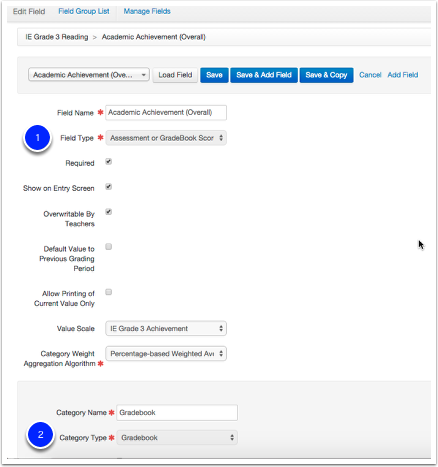 Changing this would remove and reset the default grade coming from the linked Gradebooks and/or Assessments to that of the new Value Scale, as well as change any manually entered grades for that field. Remove (3) - Removing a scale can remove previously entered data of that value, having users to go back and select a new value in the entry screen and/or set the field to follow the default. It's almost treating it like a NEW value set, while also effecting previous grading periods and other fields it is applied to. When a value scale is deleted, you are risking data to be removed from all previously entered grades for all report cards within the year. Please contact Illuminate Support Team for assistance. Grading Periods are truly important and impact how Report Cards and Gradebooks communicate. Grading Periods tell the gradebook how to calculate assignments from a start and end date. Report Cards are tied to a Grading Period. If a grading period is changed or altered, grades from gradebooks will calculate differently and therefore Report Card data will reconfigure and update. Once a Grading Period closes, Report Card data becomes meta-data that is available for Custom Reports. It is best advised to give entry-windows within Grading Periods more time than less, especially for the first round of use in Illuminate. Windows can easily be adjusted throughout the grading period, prior to the end date. Once the end date has occurred and the grading period and/or window must be changed, the System Admin or Report Card Administrator must call Illuminate Support to unlock grading periods. This will allow you to open the window for an additional 24 hours, where it will then lock again. For more information, please visit Set Grading Periods.